Like many people, Peggy loves animals and has a passion for training. She currently owns 5 minis, 2 full sized horses, and 3 parrots. 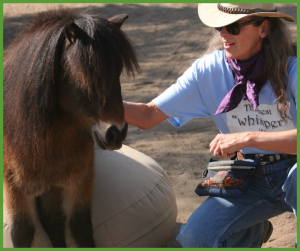 Learning from clicker trainers of other species, Peggy investigated ways to add more shaping, capturing, luring, and targeting to her program and she experienced how horses would learn complex behaviors freely if given the choice. Peggy currently teaches, gives clinics, offers online courses and generously shares knowledge of Clicker Training. 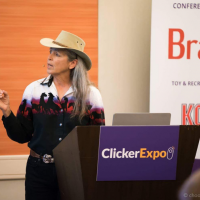 Peggy has also been a speaker at Clicker Expo every year since 2013 and is thrilled to be presenting at Clicker Expo in 2019. Her goal is to learn how to better share this amazing technology with people in the horse community. What a great podcast, really good feeling to hear you chatting together Ryan and Peggy. Love the tribe.